So You Wanna Know More? *The name of this blog was inspired by a dirty window. One very dirty window. Find out more about the beginning of Lasting Thumbprints here. 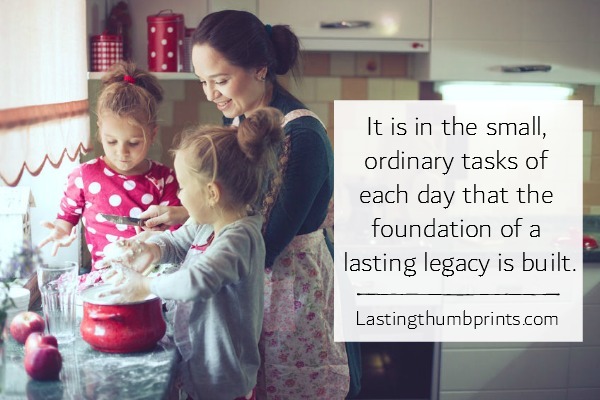 Lasting Thumbprints is the story of my journey to create a meaningful legacy for my family. Not one of monetary value (although that wouldn’t be bad! ), but one of much more worth. My hope is that you and I will be inspired to make the most of every moment, every relationship, every encounter to be one of lasting value. That we would be encouraged in the small, ordinary tasks of each day because that’s where the foundation of an enduring legacy is built. We leave a mark on everything that we touch. An impression in every interaction we have. And we get to choose if it will be one that brings life and hope. This is my pursuit of that legacy. I hope you’ll join me! I’m a home educating mom of five fun kiddos, 3 boys and 2 girls who range in age from 17-3. They keep me busy and smiling. My husband is a public school teacher and coach. (No, the irony is not lost on me.) He’s pretty cool, too. 😉 Really, I’m just an ordinary girl who loves a great, big God. And if it weren’t for God, I wouldn’t be so ordinary…I’d be a big, fat mess! I was named after my father. His name is Joseph Anthony. Mine is Jo Ann. I would take peanut butter over chocolate any day. I’m not fond of heights. I make funny noises when I’m cold. I don’t like to touch cotton balls. It creeps me out. I once helped edit an encyclopedia. I don’t blog grammatically correct. I like polka dots. And zebra print. Probably not together though. When I was 18, I lived in a retirement village. I don’t like to have unpainted toenails. Mason jars make me happy. I lock myself out of my house and car more than the average person. So that’s a dozen things that make me strange unique. I hope you’ll stay and visit for awhile, I’d love to have your company! If you would like to be added to our mailing list, you can subscribe via email or via RSS. You can also find out how to contact me here!